Measuring Activity Levels in Children – What Already Exists? A sector-wide method of measuring young peoples’ activity levels is not widely established. Therefore, there is no ‘go to’ method for physical activity providers, such as schools and community sports clubs, to identify children at risk of inactivity and assess the effectiveness of interventions. Despite this, there are multiple methods in which activity levels have been measured, albeit each with unique strengths and limitations. The British Heart Foundation has recommended reports from early years’ practitioners, however, this is both costly and time consuming, whilst also requiring a trained individual to carry out the observation. Objective methods such as pedometers and accelerometers are scientifically valid, however require trained individuals to interpret the results2. Thus, self-report questionnaires are the most common method used to assess physical activity in children, being low cost for large populations. However, there is currently no standardised questionnaire used across the sector, despite questionnaires being used and validated in scientific studies. Questionnaires measuring young people’s physical activity levels have been used in research across the sector. The Taking Part Survey, administered by the Department for Culture, Media and Sport measures participation over the last 7 days and the last 7 weeks in interview style, whilst the Health and Social Care Information Centre uses a similar method3,5. The Physical Activity Questionnaires for Older Children (PAQ-C) and Adolescents (PAQ-A) are both self-administered questionnaires and measure activity over the last 7 days4. It is not always possible for a child to complete a self-report questionnaire alone, whilst memory recall can also pose problems. For younger children, parental completion on behalf of the child is necessary. However, despite this being validated as an appropriate method in children aged 3-6, this limits questions to activity that has taken place outside of school1. Secondary school aged children can complete questionnaires themselves, however providers could administer these in a classroom setting to ensure clarity and understanding. Memory recall may lead to under-representation of activity levels because activity can be forgotten, especially when activity is spontaneous. Therefore, cue cards suggesting activity that may have occurred are a useful resource, acting as prompts. This is especially important when being asked to recall activity over several days or weeks3. In contrast, self-report data can also lead to over-representation of activity levels, as participants can eliminate or include answers that they believe are more socially accepted. Intensity of activity, specified in CMO guidelines, is overlooked in many questionnaires making identifying whether activity is moderate or vigorous difficult. Many existing questionnaires have a strong focus on sports participated in, duration and frequency. Therefore, questions recognising how the activity made the participant feel could be implemented, ensuring language is suitable for the relevant age group, such as “It made me breathe more heavily” or “I found it hard to continue talking when doing the activity”. These examples allow children to recognise how they felt and will align to intensity of activity. It would be difficult for a parent to answer such questions on behalf of the child, so there is potential to complete the survey with the child, or include questions regarding intensity for older children only. Furthermore, questions on travel habits to identify the use of active travel can identify whether the child is encouraged to undertake regular activity as part of their daily routine, or whether this is replaced by sedentary methods5. Understanding of physical activity in schools is limited, amplifying the need for tracking children’s activity levels outside of school. However, there are a number of ways that schools can better understand physical activity provision. 91% of schools track the amount of time children spend in PE lessons, suggesting that the importance of monitoring participation is recognised. However, it has been suggested that this is not accurate as children are not moving during the entire timetabled allocation to physical education. Instead, time in which the child has opportunity for movement should be measured, which 43% of schools currently do, as opposed to time spent in queues or getting changed, whilst ‘learning by doing’ should be incorporated across the curriculum. 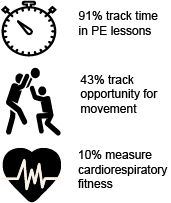 10% of schools utilise indirect measurement of children’s cardiorespiratory fitness levels such as the multi stage fitness test, which could be used to identify children at risk of health complications resulting from inactivity6,7. Virginia currently works as the Youth Participation Programme Manager at British Fencing. Prior to this she worked for Women in Sport, where she project managed ‘Changing the Game for Girls’. This involved extensive research into measuring attitudinal changes to physical activity in an attempt to understand why there is such large drop off in girls’ physical activity levels in schools. How did you go about designing the surveys that were used for the project? The questions were taken from an already existing questionnaire, pulling out key elements most relevant to the school. This was so that schools could address pertinent issues, as teachers ultimately want to understand their own students and how they feel. If you were starting the project again what would you do differently? In terms of getting schools to return completed surveys, it is important to offer an incentive. This should be offered at the end of a project to ensure all requested data is returned. Furthermore, some schools had limited access to technology, so getting enough computers or laptops for all the girls to fill out questionnaires was a challenge. Therefore, providing paper surveys would have been helpful, although we would need somebody with lots of time to input the data afterwards! In terms of measuring changes in attitudes, it is important to identify the correct time to administer surveys and provide a window in which schools must complete these. Furthermore, time scales for subsequent surveys should be adapted dependent on previous completion dates. What is your best piece of advice for designing and administering surveys? 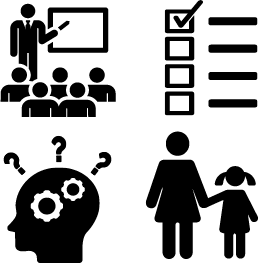 In order to make an impact, questionnaires should be relevant to the school or club. Providers can believe that a national level problem isn’t an issue that they face. Therefore, by adapting a questionnaire in collaboration with the school and presenting data specific to their students, schools are more inclined to make changes as a result of the insight. For example, one school was able to identify that, due to its unique geographical location, one year group wanted the opportunity to go off site in order to attend a gym. By adapting the timetable staff were able to take the children out to a leisure centre, enabling them to be more active. Being able to measure physical activity and therefore identify inactives is important. It is also beneficial to shape surveys to the specific audience, in order to get the most useful and relevant insight. There are a number of existing surveys and questionnaires from which inspiration for questions can be taken, whilst gaining insights into attitudes can help to target inactives and change behaviours. If you have any questions about how we can work with you to satisfy your insight needs, please get in touch with the London Sport Insight Team (insight@londonsport.org). Bayor, O., Jarczok, M., Fischer, J., von Kries, R. & De Bock, F. (2012). Validation and Extension of a Simple Questionnaire to Assess Physical Activity in Pre-School Children. Public Health Nutrition. 15(9):1611-1619. British Heart Foundation (2015). Physical Activity in the Early Years. Department for Culture, Media & Sport (2016). Taking Part 2015/16 Annual Child Report. Kowalski, K.C., Crocker, P.R.E., Donen, R.M. (2004). The Physical Activity Questionnaire for Older Children (PAQ-C) and Adolescents (PAQ-A) Manual. Scholes, S. & Mindell, J. (2013). Physical Activity in Children. The Health and Social Care Information Centre. Vol. 1 Chap. 3. The All Party Parliamentary Group on a Fit and Healthy Childhood (2016). Physical Education. UK Active (2015). Generation Inactive. Emma is an Insight Intern at London Sport. A Sport and Exercise Science student, she enjoys being able to apply course level knowledge to practical work within the sector that has the capability to make real changes. In order to understand commonly used methods of measuring young people’s physical activity levels and identify the challenges associated with these, Emma conducted a review of existing literature.